New York Tribune editor Horace Greeley had supported Ulysses S. Grant's successful presidential candidacy in 1868 and initially his administration as well. 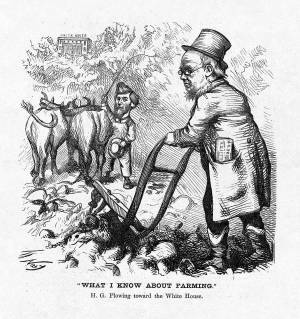 Yet over time Greeley's doubts about the quality of President Grant's leadership multiplied, and the editor found it hard to dismiss the possibility that he might enter the political arena. In early May 1871 Greeley declared in an editorial that he had reservations about Grant and the propriety of a second consecutive term. Immediately thereafter Greeley departed on a three-week journey to the South, ostensibly to deliver an address, entitled "Suggestions to Farmers," at the Texas State Fair in Houston. At other occasions on the trip, he touched repeatedly on current politics and sectional problems. His remarks attracted wide attention in the press, and speculation that he might be considering a run for national office.